Day 282: Express Pass to Argentina . . . So, today was just one of those beautiful mornings when you just knew that something exciting was bound to happen. After being up and at ’em early this morning to address our normal Sunday a.m. routine, we hopped in the car and headed west. Kerrville was our destination – had to go by house there and take care of a couple of repairs for our renters. Committing to be on site by 12:30 p.m. made for some interesting scheduling today (luckily our Sunday commitments are early!) and off we went. We love the 1.5 hour drive across Texas to our destination – today’s challenge was a whiteout downpour heading into San Antonio and a nasty rain slick road induced accident on I-1o outside of Boerne. As we passed slowly along with the back-up on traffic it looked as though no one was hurt and five cars were involved. Gentle reminder to go a wee bit slower on the road especially when it starts to rain and all the oil bubbles up causing a very slick surface to emerge. By the time we hit Home Depot to pick up some repair supplies, the rain was nowhere to be found so we headed off to play “Mr. and Mrs. Fixit”. By 1:40 p.m. we had finished installing a new light fixture, replaced some faucets, cleared up a sink drain issue and corrected some power outage issues – not too shabby for this team. We had one other appointment in town to talk to realtor about our next steps then off to P & L’s for a quick visit before heading back home. As we enjoyed some yummy cheese, crackers, sausage, peaches, apples, grapes and peanuts we were invited to partake in a wine that P & L found on a recent trip to Argentina. We have Argentina on our bucket list, but for the time being will have to live vicariously through P & L as they share their adventures and wine finds – isn’t that what friends are for? 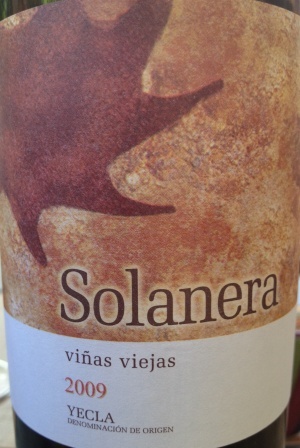 We sampled a 2009 Solanera. This fun little wine is a blend of 60% Monastrell, 20% Cabernet Sauvignon, and 20% Garnacha Tintorera (aka Alicante Bouschet) raised in 500-liter French oak. The color surprised us as it was a dark ruby-red color – the palate was ever so great with a subtle tobacco / smoky taste that transformed nicely into a tart little fruit bomb on the finish. This wine was a superb blend and ever so smooth – as mentioned the little hint or two of smoke and tobacco made for a great combination – a couple of our taste buds could swear that a dash or two of vanilla ice skated across our tongues – ever so lightly, but just enough to notice. We have to admit – this is a really inexpensive wine – about $9.50 per bottle and tastes more like a $15 – $20 bottle – yet another reminder that not all great tasting wine in expensive and not all inexpensive wine is lacking in taste. Not so sure if we have to return to Argentina to retrieve a couple more bottles of this gem or if P & L can help us out with this one – regardless, this is a wine that we will enjoy again will be added to the Top Ten Bondy Deck Wine List! As we enjoyed our afternoon snack, the clouds mustered together and decided to drop a good squall on the deck where we sat – off we skirted for the inside and watched the much needed rain come tumbling down. By late afternoon the sun returned and home bound we went. What a great way to spend a Sunday with good friends who share the same passion as we do for good wine . . . we are blessed. Tomorrow is a new work week – hope you are ready!!! As you steel yourself for what lies ahead always remember to enjoy responsibly and recycle whenever possible. Categories: Uncategorized | Tags: 2009 Solanera, Kerrville, vinas viejas, yecla. P&L | Permalink.